The “Martinis, Beanies, and Weanies” crew, who worked tirelessly to make this a successful hospital fundraiser, and hosts Tig and Lucille Tarlton stand in front of the Tarlton Barn. 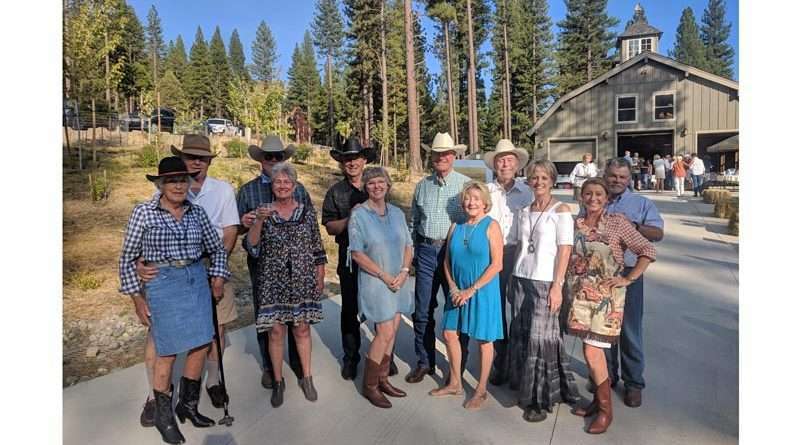 From left: Tig and Lucille Tarlton, Bill and Kathy Kenneroth, John and Sharla Scott, Marsha and Frank Shepard, Larry and Renee Walker, and Randy and Katy Magliano. 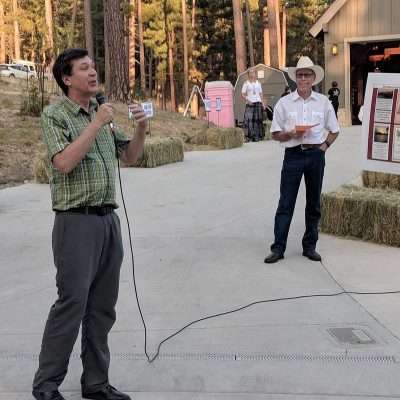 Representing Eastern Plumas Health Care, Dr. Paul Swanson thanked the organizers and the hosts for putting on a wonderful event while Larry Walker, emcee for the evening, looks on. He also explained the importance of the hematology analyzer to the hospital. This vital piece of equipment was the recipient of funds raised at Hoedown II For the hospital held Aug. 18. Eastern Plumas Health Care’s annual fundraiser, Hoedown II, brought in a whopping $33,540 to fund a much-needed hematology analyzer for the hospital. The “Martinis, Beanies, and Wienies” group organized and put on this event, the second of its kind in three years. The group, comprised of Larry and Renee Walker, Frank and Marsha Shepard, Bill and Kathy Kenneroth, Randy and Katy Magliano, John and Sharla Scott, and Tig and Lucille Tarlton created an unforgettable evening, with a full bar, wonderful food catered by Grizzly Grill, and hoedown music by the Simpletones, Mike Hogan’s band. The Tarltons again donated their barn and grounds, making for a memorable evening at this beautiful home overlooking Mohawk Valley. Tarlton’s vision when he built this barn was to create a beautiful venue in keeping with the landscape, where community events like this one could be held. On Aug. 18, over 180 community members joined in to bid for auction items including a week at the Marriott’s Newport Coast Villas; a three-night stay at a home in Stinson Beach; two nights luxury accommodations at Club Donatello in Union Square, San Francisco; and a gourmet dinner for eight by Chef Sean Conry. There were also lots of elegant drawing baskets to choose from, including donations by two sought-after local artists — a Kathleen Friedman painting, and cutting boards by George Halvorsen. This kind of hard work and community support are essential in providing the needed funds for vital hospital equipment, according to Linda Satchwell, EPHC’s communications coordinator. The new state-of-the-art hematology analyzer, suggested as the recipient of donation funds this year by EPHC Lab Manager Bill Carlson, returns a complete blood count and assesses infection and anemia. This new analyzer replaces the hospital’s nearly defunct one. It will pay for itself in four years, according to Carlson, with the savings in reagent (which runs the machine like gas in a car) and maintenance costs. “We’re able to do most lab tests right here. We have a 20-minute turn around time for the ER, which is required of the district’s CLIA licensed lab. This new hematology analyzer will aid us in meeting that goal,” said Carlson. CLIA regulations establish quality standards for laboratory testing performed on specimens from humans, such as blood, body fluid and tissue, for the purpose of diagnosis, prevention, treatment of disease or assessment of health. 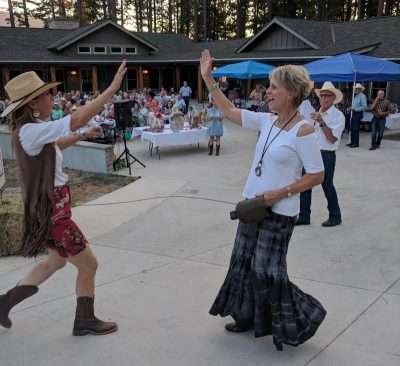 Martinis, Beanies, and Wienies began in 1997 as a party thrown for 35 friends at the home of Frank and Marsha Shepard in Plumas Pines with the help of Larry and Renee Walker. The last year at the Shepards’ home, they hosted 150 friends. Because the party had outgrown their house, they cancelled it for a couple of years. Since then, it has been a party for EPHC. It moved to the Walkers’ back yard with a band, and brought in around $10,000 the first couple of years, and, it picked up several other friends of the original organizers: the Kenneroths, Maglianos and Scotts. With the move to the Tarlton barn, the amount raised at Hoedown I was over $28,000 and this year, over $33,000. In all, the Martinis, Beanies, and Wienies group has raised a stunning $81,000 for the hospital. And while the food has migrated from beans and hotdogs to a gourmet feast and the drink menu has vastly expanded, the intent of this group remains the same — to support the community they love. 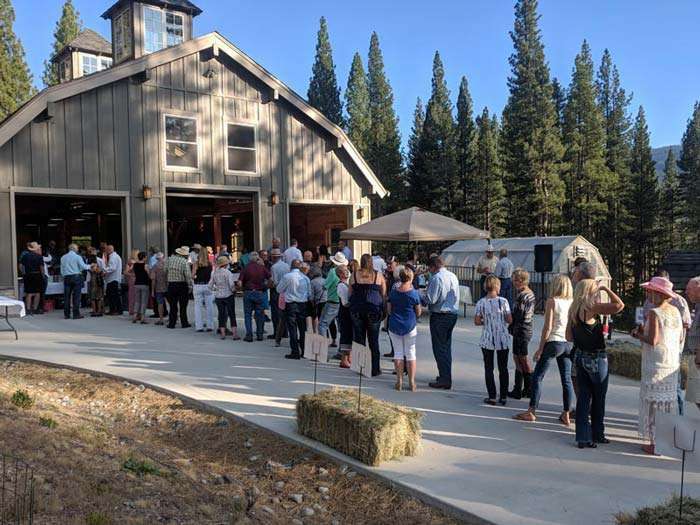 Attendees line up for the delicious dinner catered by Grizzly Grill, moving toward the Tarlton Barn which owner Tig Tarlton had built specifically to host community events like the hospital Hoedown.